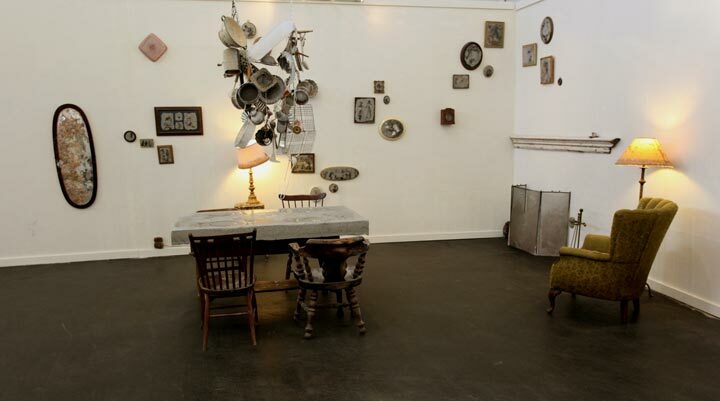 San Francisco artist Alexis Arnold loves to explore unpredictable three-dimensional sculptures. With previous works centered around everything from training bra nets to faux-lawn upholstered decorations, her more recent Past Of Our Future and The Crystallized Book Series sees Arnold mixing scientific experimentation with everyday objects. 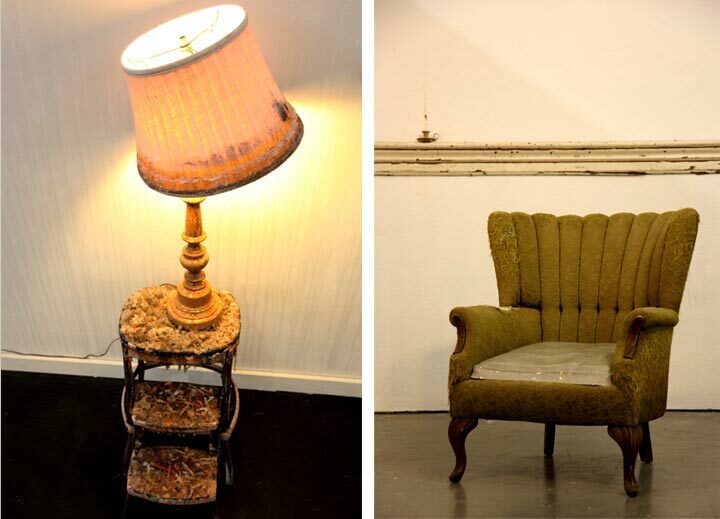 Combining Borax crystals with things near and dear to human hearts, like vintage furniture and weathered books, Arnold grows wonderfully organic forms out of objects both malleable and solid, invoking nostalgia all along the way. As Arnold says herself in the following interview, “Time (and its physical/visual presence) is an ever-present concept in my work, as well as a large factor in crystal growth” — and it is this idea that adds even more importance to the past in her sculptures, as it contrasts with the present. 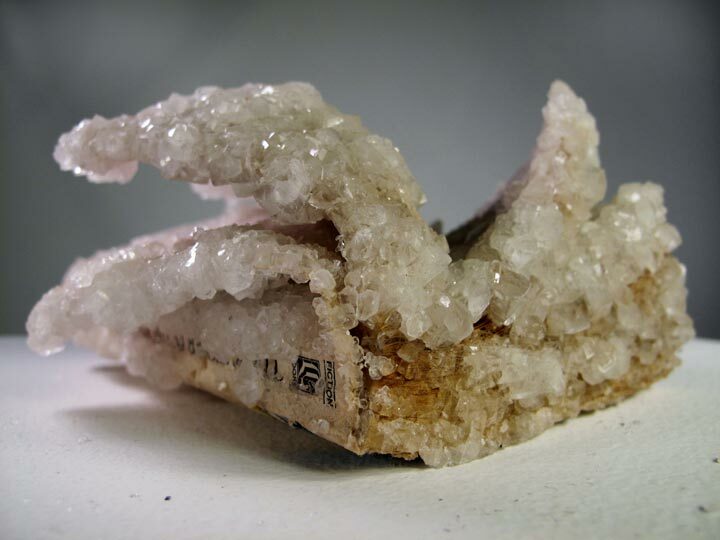 What first inspired you to work with Borax crystals? While I have had a fascination with crystals and minerals since I was little, their inclusion in my work happened somewhat by chance. About three years ago, I was force-rusting a metal sculpture using vinegar, salt, and soda ash when I noticed crystals growing on the concrete floor of my studio. Since I was working with concrete at the time, I decided to try and replicate the crystal growth with intention on the concrete and other objects. In addition to my aesthetic fascination with them, the crystals related conceptually to the project I was creating at that moment. The conceptual and aesthetic functions of the crystals have morphed with each project since. Time (and its physical/visual presence) is an ever-present concept in my work, as well as a large factor in crystal growth. 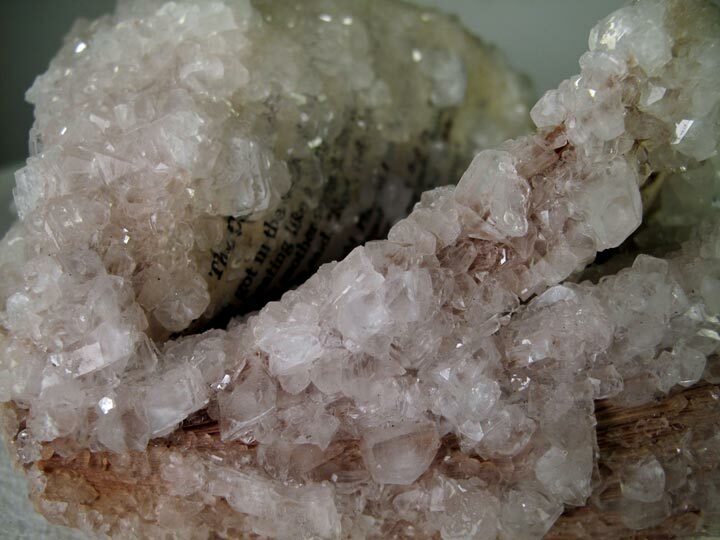 Crystals found in nature generally form over thousands of years. In my studio, I get to play with nature and adjust its time frame. I mainly use Borax and Epsom salt crystals. This is because of their relatively cheap availability and non-toxicity. The Crystallized Book Series was prompted by continuously finding boxes of discarded books/magazines, the onset of e-books, and by the recent disappearance of bookstores. Furthermore, I had been growing crystals on hard objects and was interested in seeing the effect of the crystal growth on malleable objects. Was there a method or goal behind your choice of literature or the ways in they were presented that goes beyond the aesthetics? If so, what is it? I try to incorporate mostly found books over buying specific titles, but select amongst them for the most conceptually and/or aesthetically appropriate. If I desire a specific title, I will buy it used. For example, the Bible and The Crystal World were purchased for particular conceptual reasons. I take titles from my own library collection as well. 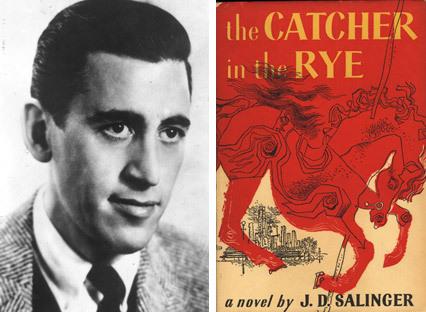 I choose certain books, such as The Catcher in the Rye, for the nostalgia people have for them. I have used a number of children’s books for this reason as well. One of my favorite found books for its conceptual tie to the project is a copy of 20,000 Leagues Under the Sea published through the Classics to Grow On series. Dictionaries, encycolpedias, and phonebooks are some of the more commonly discarded books these days, hence they find their way into my work. 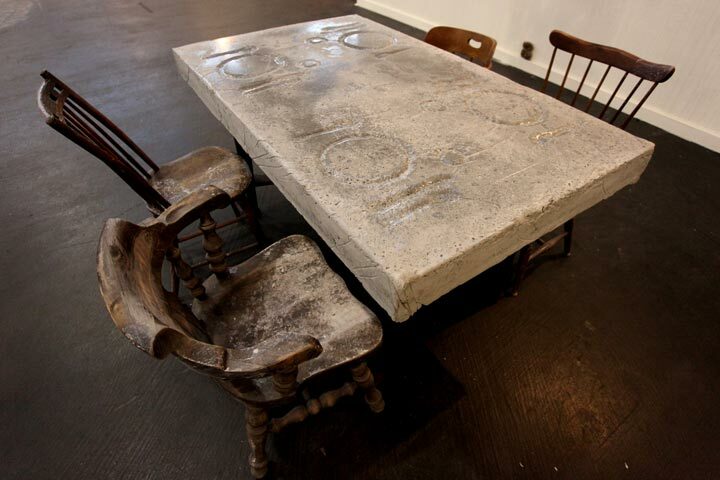 The series addresses the materiality of the book vs the text/content of the book. 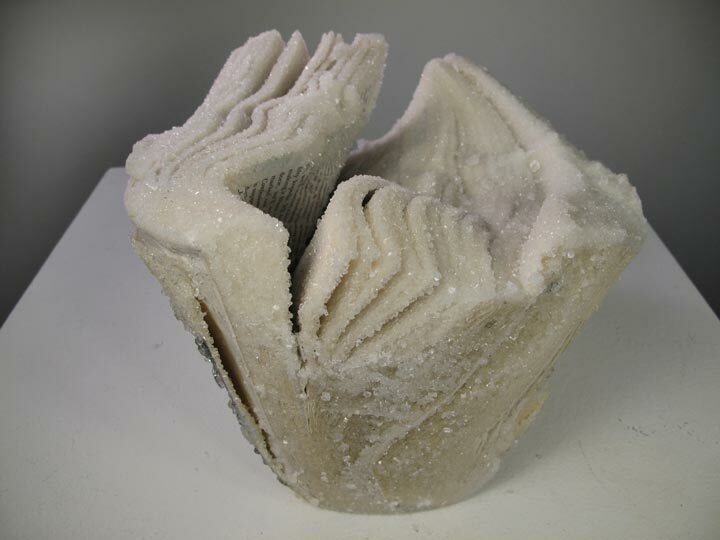 The crystals remove the text and transform the books into aesthetic, non-functional objects. The books, now frozen with heavy crystal growth, have become artifacts or geologic specimens laden with the history of time, use, and nostalgia. The stories included in books often exist in our memories while the book remains a spine on a shelf. I love how just seeing a book can conjure the story contained within. With the addition of the crystal growth, the story within the book remains in memory, but new stories can be created by viewers as well. The series also illustrates one of the things I love about books or magazines, which is the lingering presence of the reader through the bent and folded pages longer after the book has been read. 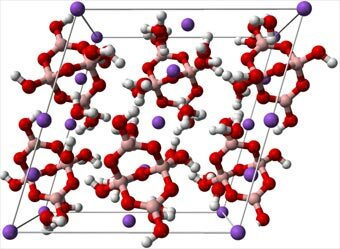 Was there anything you learned about the structures of the materials you used that seemed particularly noteworthy or fascinating? I enjoy how malleable books become when submerged in hot water, even hard covers. This allows me to transform the books into new shapes that reference geologic specimens or artifacts. I find the structure of crystals fascinating. Each type of crystal shares the same molecular formula that repeats in a three-dimensional pattern, yet they present themselves in a myriad of shapes and sizes depending upon impurities, rates of formation, and environment. 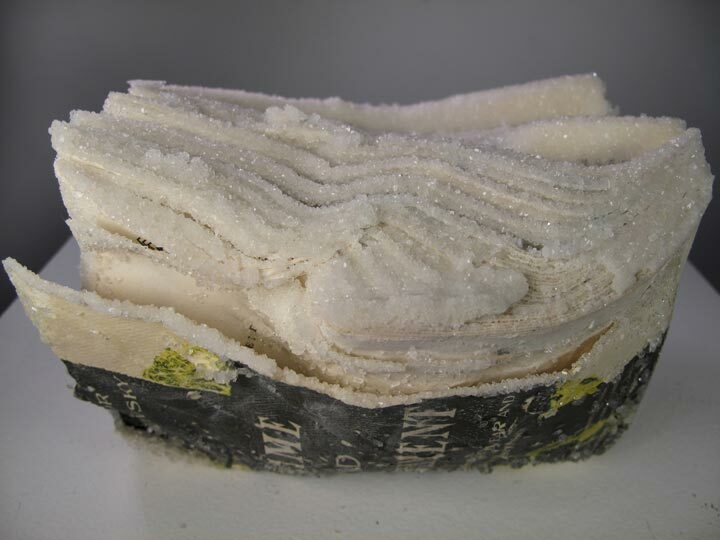 Are there by chance any quotes or passages during your creation of these borax-crystallized books that seemed appropriate to the project itself? While no particular passages or quote come to mind, I came across the book, The Crystal World, by J.G. Ballard while creating this series. The book is about a mysterious disease that crystallizes everything in its path from plant to animal to man, and certainly holds some inspiration for me. This may sound odd, but I wanted to let you know I am a woman. I recently had an article written for a Brazilian newspaper (O Globo) where I was referred to as a man, so I have learned it’s best to clarify this. 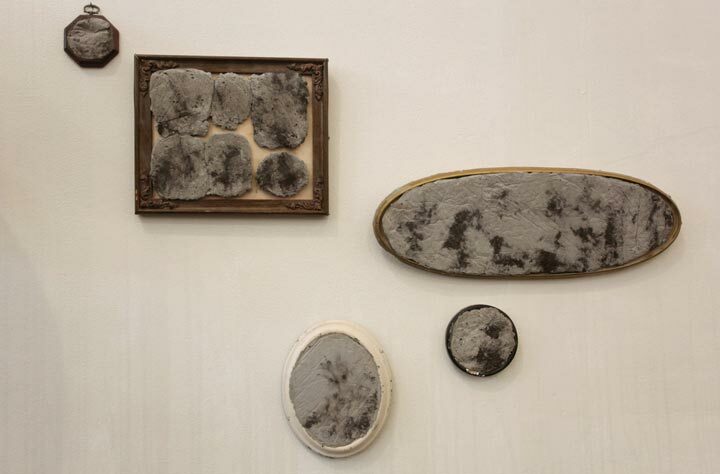 For the remainder of 2012, Alexis Arnold has work showing in various San Francisco galleries. 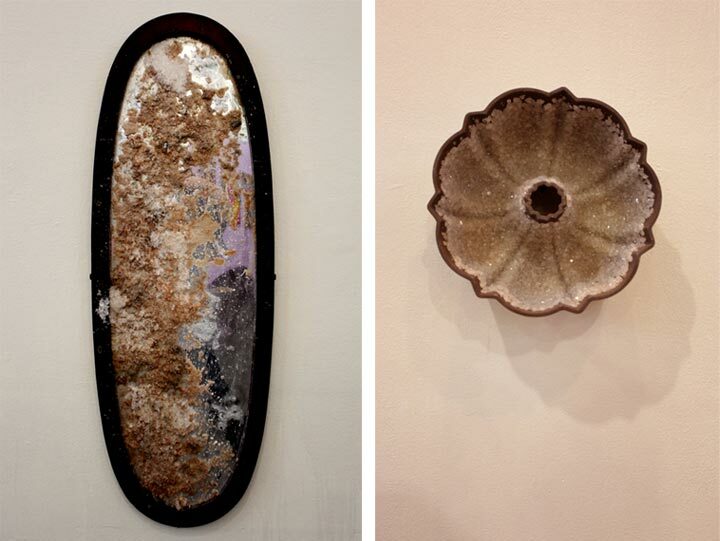 See it at Alter Space through August 19th and Gallery Hijinks through July 28th. She will be showing collages and Salon Dehon for the month of August, as well as large crystallized book sculptures at Root Division Biblio Babel show in November.